Produce takes the starring role in this colorful salad: Crisp, leafy greens are mixed with bright orange carrots, jewel-toned bell peppers, purplish onions, and fire engine red tomatoes. Grilled chicken and beans provide high-quality protein. Top the lettuce with the sliced chicken, chickpeas, and vegetables. 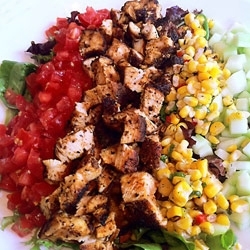 Dress the salad with the vinaigrette.